You’re invite you to take a look behind our walls: No reservation necessary. Brilliant design is in our blood. We believe it’s important to craft every part of your coach correctly, even if you can’t see it. That’s why we invite you to take a look behind our walls. 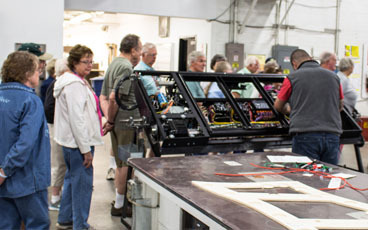 Marathon Coach offers year round factory tours at its Oregon headquarters, Monday through Friday at 11:30 a.m. Tour our production facility and you’ll see everything from bare shells to cabinet scribing to flooring installs. Nothing is hidden. A typical tour lasts approximately 30 minutes, but may span slightly longer. 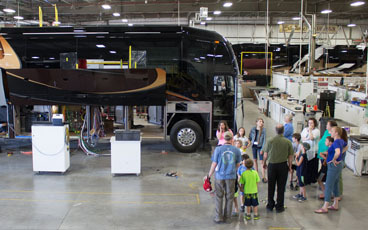 Come see firsthand how a Prevost bus shell becomes a luxury Marathon coach. Visit our Oregon facility at 91333 Coburg Industrial Way, Coburg, Ore., or call (800) 234-9991. 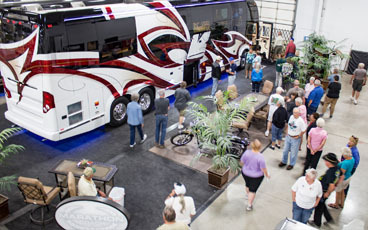 Visitors are also welcome to stop by any of our three nationwide locations to view coaches currently on display.